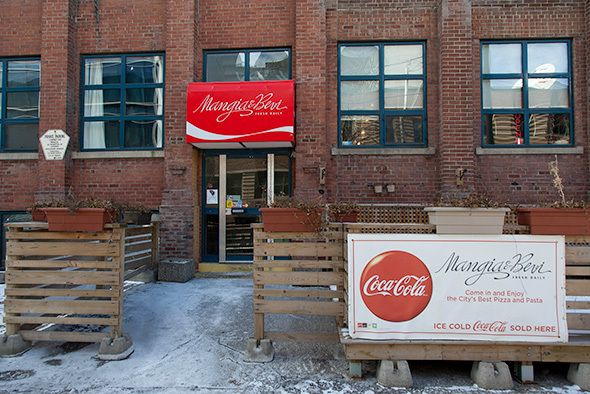 Mangia & Bevi started out nine years ago with modest beginnings as a grab and go coffee and sandwich bar just around the corner from George Brown off King Street East (main entrance on Ontario Street), but has now blossomed into a full service restaurant with a licensed bar and killer pizzas. Tucked away on the main floor of an office complex, the restaurant is packed during a mid-week lunch, with an interesting mix of suits, construction workers and ladies who lunch. Most seem like regulars who don't even so much as glance at a menu, instead preferring to order their tried and true favourites or trusting Chefs Giovanni Cundari, Steve Walchuk and Raj Sivasothy with one of their daily rotating specials. Owners (and siblings) Federico and Eleonora hold court in the kitchen using recipes from their family back in the Veneto region of Italy. Most things are seasonal and homemade, save for a few key ingredients and sauces that are imported for authenticity. Service is as breezy and casual as the unpretentious dining room. With ample spots at the bar, a private dining room for larger parties, two other spaces flanked by the open kitchen, and (come the warm weather) a nice looking patio, Mangia & Bevi is a bit of a hidden gem. Crushed to hear they were sold out of carpaccio, we try the bresaola ($15) an air dried, seductively salty beef loin that's aged for months and well worth the wait. 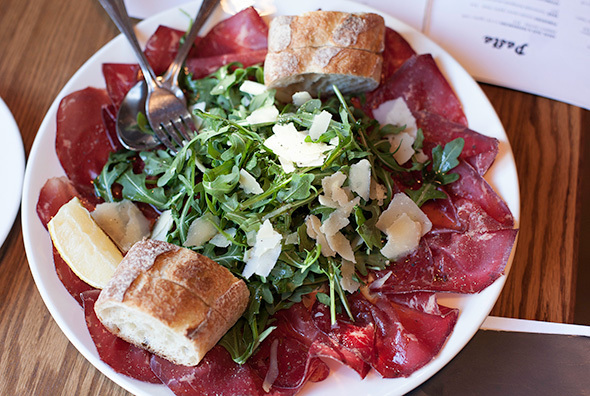 The plate comes with layers of cured meat, decoratively circling a pile of arugula and flakes of parmesan cheese. After a quick peek at a wine list exclusively from Italy, we decided to wash our meat down with a half bottle of Ripasso ($29). Funghi Nordici ($16, lead photo) is yet another ample portion of arugula and parmesan cheese, this time with the addition of sautĂŠed mishmash of field mushrooms. While the dish was tasty enough, the $16 price tag for mushroom salad was hard to swallow. 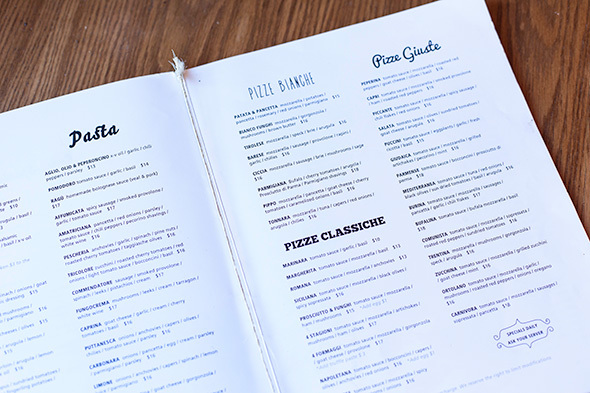 Perusing the three pizza menus (bianche, classiche, guiste) The Communista ($16) stood out. While they don't have an actual wood burning oven (gasp!) they also buck the Napoli trend with their sourdough crust, which translates to a bubbly and intensely crusty base. 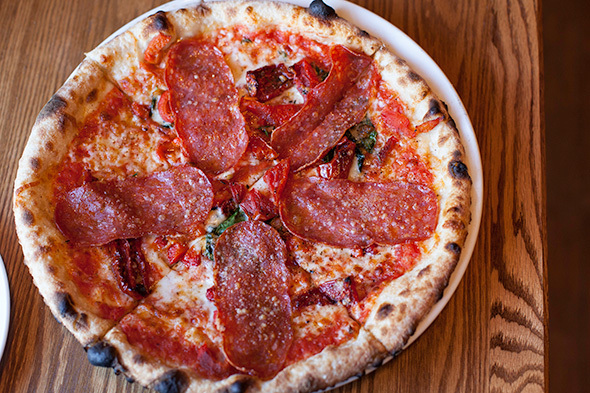 Topped with roasted red peppers, sundried tomatoes and sopressata, this pie is further enhanced with San Marzano DOP tomatoes, combining the best of both worlds making it a contender for the best pizza in Toronto. 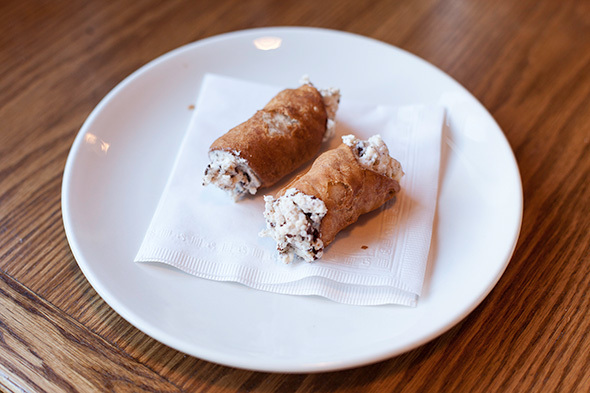 Cannoli ($2.50 each) are made in house as well, and are pretty awesome. The shell is super crispy and the ricotta filling has just the right amount of sweetness thanks to the chocolate chips. Drip coffee ($1.75) completes the meal. While they may fly under the radar a bit, Mangia & Bevi is a solid contender for the ongoing pizza rivalry in Toronto. With a whopping 32 pizzas featured on their menu, you're only limited by your imagination, and your belt suddenly tightening. Mangia & Bevi accepts reservations of all sizes and offers takeout as well.